NEW YORK, March 15, 2018 –Vacation time is precious, and travelers today have higher expectations and more options than ever. Consumers continue to invest more in experiences and make choices based on the range of emotional benefits gained from quality time away. 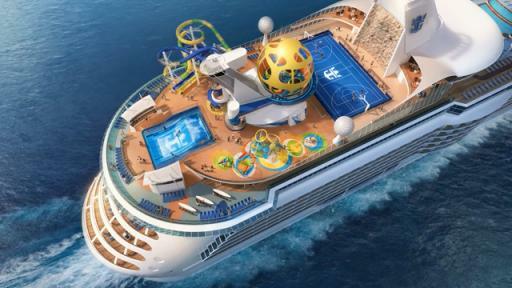 Knowing this, Royal Caribbean International is making a multibillion-dollar investment in providing its loyal guests and the next generation of cruisers with the most advanced, customizable vacation adventures that will lead to rich, memory-making moments worth experiencing and repeating. A cruise vacation is much more than the ship itself. In one of the company’s most ambitious projects yet, Royal Caribbean is changing what it means to thrill and chill on vacation with the unveiling of its new Perfect Day Island Collection, a series of unrivaled and exclusive private island destinations around the world. 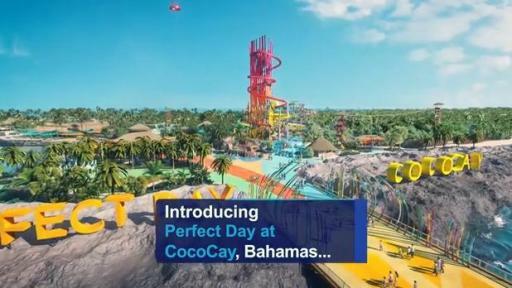 The first in the collection, Perfect Day at CocoCay, is a $200 million transformation of the cruise line’s existing private island in The Bahamas that will deliver the ultimate family destination in the Caribbean. 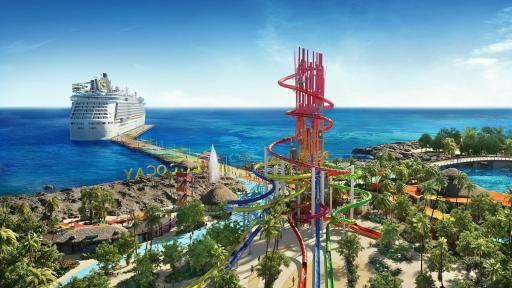 Thrill Waterpark, featuring two brag-worthy water towers with 13 slides – the most slides found in any waterpark in the Caribbean – will include the 135-foot-tall Daredevil’s Peak, the tallest waterslide in North America. In addition, the waterpark will feature the Caribbean’s largest wave pool and a kid-friendly obstacle course pool. A 1,600-foot zip line that crisscrosses the island at up to 50 feet high and features the only water landing in the Caribbean. A helium balloon, dubbed Up, Up and Away, floats up to 450 feet above the ground providing for the highest vantage point in The Bahamas. The exclusive Coco Beach Club, will offer an upscale island experience that will feature the first overwater cabanas in The Bahamas. Royal Caribbean ships departing from the U.S. states of New York, Maryland and Florida will call at Perfect Day at CocoCay, providing guests with vacation adventures like no other in the Caribbean. The island transformation will roll out in phases beginning September 2018 with the completion of a new pier, and by spring 2019 the majority of the island’s experiences will be open. Coco Beach Club, the final phase, is set to open November 2019. Additional Perfect Day Island Collection destinations in Asia, Australia and the Caribbean will be announced at a later date. Adding to recently announced digital innovations, including frictionless check-in, stateroom technology and a new mobile app, the cruise line has committed $900 million to reimagining its fleet through a new modernization effort called Royal Amplified. Spanning 10 ships in four years, the program will touch every facet of the guest experience, and introduce a wide range of innovative features and bold, new experiences, including specialized pool spaces, experiential dining and nightlife concepts, and first-of-its-kind attractions like Sky Pad, an out-of-this-world virtual reality, bungee trampoline experience. Royal Amplified reflects the company’s passion for innovation, relentless attention to detail and commitment to delivering the best vacation in the world. Royal Caribbean’s increased popularity among millennials resulted in the cruise line being named “Cruise Line Brand of the Year” in The Harris Poll’s 29th annual EquiTrend Study. This important, rising generation of travelers opts for more frequent and often shorter vacations, and Royal Caribbean is answering that call by amping up its short Caribbean getaways, setting a new industry standard. In summer 2018, Mariner of the Seas will undergo a $90 million modernization adding new thrills, including Sky Pad and a glow-in-the-dark laser tag experience; The Bamboo Room, a retro lounge with tiki-chic décor; and the fun, vibrant Playmakers Sports Bar & Arcade. Mariner will sail 3- and 4-night cruises from Miami, FL redefining the weekend getaway. Sister ship Navigator of the Seas will follow in 2019, and receive an even more extensive modernization before joining Mariner of the Seas to offer short escapes. In 2019, both ships will call extensively on Perfect Day at CocoCay, making for the most ultimate quick getaway. 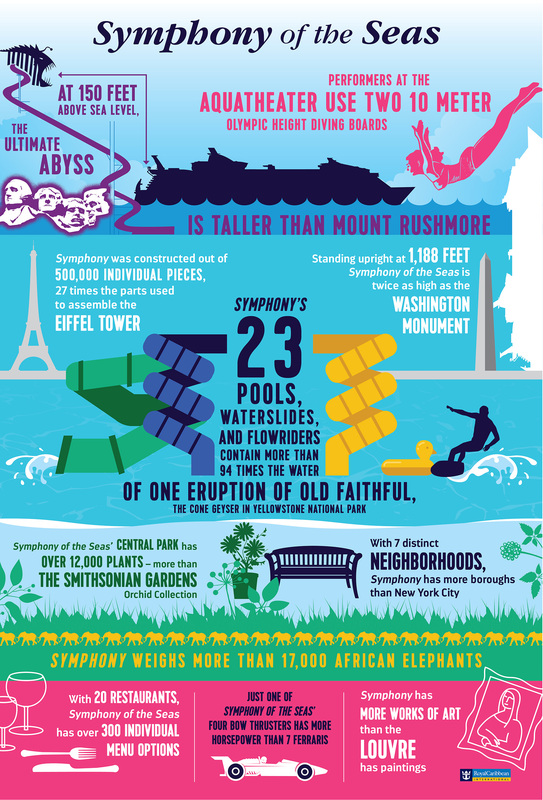 Beginning in April 2018, Royal Caribbean’s newest ship, Symphony of the Seas, will make waves not only as the world’s largest cruise ship but also as the ultimate family vacation. True to her name, Symphony brings together a variety of new features, including the Ultimate Family Suite; new dining options – from fresh seafood to Mexican, thrilling entertainment and live-action adventure, such as the epic glow-in-the-dark laser tag experience. 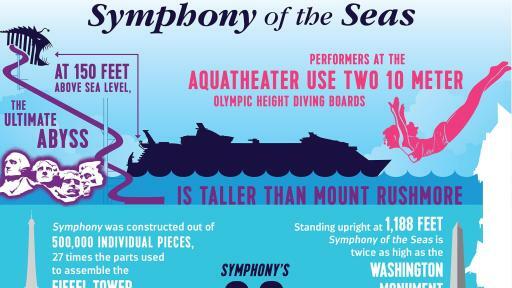 In addition to Symphony of the Seas, Royal Caribbean has a robust lineup of new ships on the horizon, including the Quantum Ultra Class Spectrum of the Seas, an evolution of the Quantum Class of ships set to debut in 2019; a second Quantum Ultra Class ship in 2020, a fifth Oasis Class ship in 2021 and a new class known as Icon, with ships delivered in 2022 and 2024, both which will be largely powered by liquefied natural gas (LNG) and fuel cells. Royal Caribbean International is an award-winning global cruise brand with a 49-year legacy of innovation and introducing industry “firsts” never before seen at sea. The cruise line features an expansive and unmatched array of features and amenities only found on Royal Caribbean, including jaw-dropping, state-of-the-art entertainment and industry-acclaimed programming that appeals to families and adventurous vacationers alike. On board, guests are catered to with the cruise line’s world-renowned friendly and engaging service by every staff and crew member. Royal Caribbean has been voted “Best Cruise Line Overall” for 15 consecutive years in the Travel Weekly Readers Choice Awards.